Operation Period: 11/23/2018 – 04/07/2019. *Booking is required by 18:00, 7 days prior to arrival. CLICK HERE to BOOK your Shuttle BUS!! Single trip JPY 3,000 / Round trip JPY 6,000 (tax included). Prices are per person per seat. Normal seating charge applies to children. No cost for infants who do not use a seat. *For guests do not stay overnight, bookings are subject to availability only. Please call to check availability 5 days prior to departure date. Bus fare: Single trip JPY 3,500 (tax included). Please use this guide to ensure you have sufficient time at the airport. Additional time for check-in/baggage claim has been taken into account. We do not take any responsibility for late arrivals/departures and/or missed flights. Please note that operation is subject to change if no reservation has been made. Timetable is subject to change or cancellation due to weather or traffic conditions. A taxi or jumbo taxi may be substituted in some cases. 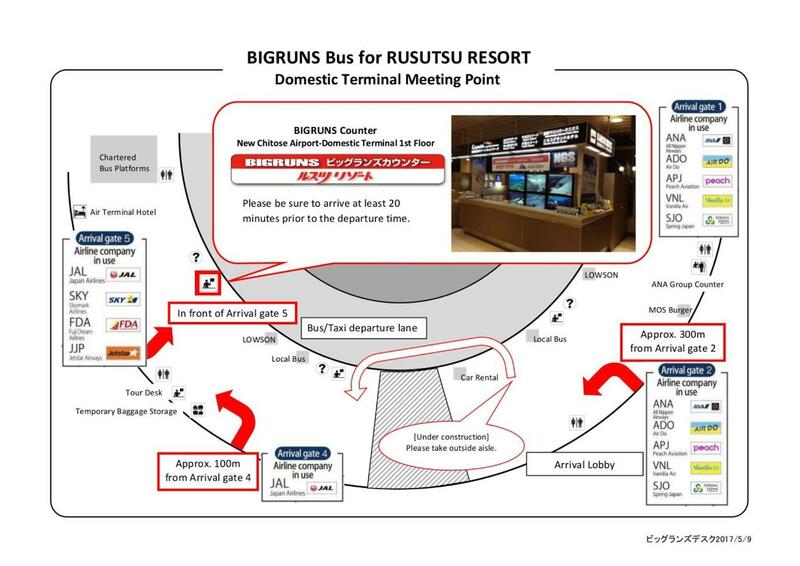 The sign for Big Runs bus is located next to the information counter on the 1st floor of the international terminal. Please be sure to arrive here 15 min. before departure time. Please wait by this sign for a member of staff to arrive. 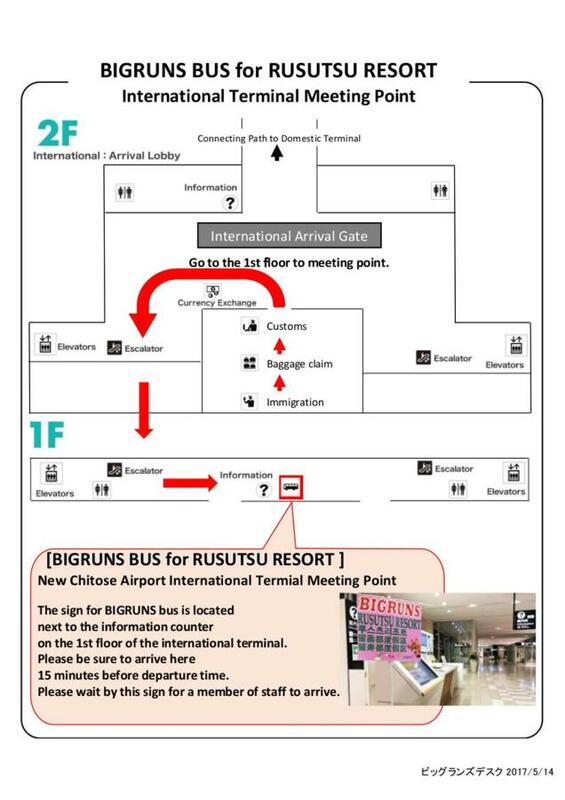 Located on 1F of Domestic Terminal Bldg, in front of Arrival Gate 5 (about 300m from Arrival Gate 2 or 100m from Arrival Gate 4). Please be sure to arrive at the counter 20 min. prior to departure.